Is President Donald J. Trump’s America First approach to foreign policy compatible with international cooperation? That question will become even more prominent in 2018, as world leaders gather for ten pivotal meetings. Collectively, these summits will reveal whether the Trump administration’s first year was an aberration or the start of a post-American world. President Pedro Pablo Kuczynski will welcome thirty-four other heads of state and government at the eighth triennial conclave of Western Hemisphere nations. The host nation is on a roll, having enjoyed a stable government and 5.9 percent annual economic growth over the past decade. But the picture is less rosy in neighboring countries mired in economic stagnation, authoritarian populism, and violent crime. Kuczynski, moreover, has been dogged by charges of self-dealing and just narrowly escaped impeachment. The Peruvian government has thus chosen an apt summit theme—Democratic Governance Against Corruption—and enlisted civil society actors across the hemisphere to advance regional dialogue on potential cures for this pervasive cancer. Lima will be Trump’s first Summit of the Americas, and his administration’s hard line on immigration, narcotics, and Cuba could become flashpoints after the relatively placid Obama years. Seeking to turn the corner after a difficult year of negotiations with the United Kingdom on Brexit, the remaining twenty-seven European Union (EU) member states will seek to relaunch the European project. The European Commission’s goal is to secure an agreement in June 2018 on concrete steps to deepen the Economic and Monetary Union, consistent with the roadmap set out on December 6 by European Commission President Jean-Claude Juncker. “After years of crises, it’s now time to take Europe’s future into our own hands,” he declared. The centerpiece of this initiative is the establishment of a European Monetary Fund, which could act as a lender of last resort for distressed banks. The roadmap also envisions a new European minister for economy and finance, as well as new EU budget instruments to ensure stability of the eurozone. President Trump’s bad manners dominated last year’s North Atlantic Treaty Organization (NATO) meeting, where the president memorably berated allies for free riding on U.S. largesse, shoved aside the leader of tiny Montenegro, and prevaricated on whether the United States recognized its collective defense obligations under Article 5 of the North Atlantic Treaty. With luck, the 2018 edition of this summit will focus on more substantive—and pressing—matters. These include reconfirming the value of multinational battle groups recently deployed to Estonia, Latvia, and Lithuania as a trip wire on the alliance’s eastern flank; bolstering NATO’s presence in the Black Sea; enhancing NATO’s cyber defense and hybrid warfare capabilities in the face of Russian aggression; and redoubling the allies’ commitment to destroy the self-proclaimed Islamic State. Additional burden-sharing commitments from European allies could help mollify the Trump administration, permitting the president to declare victory in his campaign against perceived free riding. South Africa will host fellow members Brazil, Russia, India, and China at the tenth BRICS Summit. The event will come at a critical time for both the host nation and the coalition of emerging economies. A quarter century after the end of apartheid, President Jacob Zuma and his ruling African National Congress party confront a public disillusioned by rampant corruption and the persistence of a vast underclass, even as South Africa remains the continent’s wealthiest nation. The once high-flying BRICS countries, meanwhile, face renewed questions about their coherence, given their diverse political systems, economic trajectories, and strategic interests. The BRICS, which comprise 40 percent of the world’s population and a quarter of its wealth, clearly have clout. Less clear is whether they have a common program of action beyond their general critique of the existing Western liberal order. A year after threatening to “totally destroy” North Korea, President Trump will return to New York for more diplomatic speed dating with world leaders. Presuming that war will not yet have broken out, the administration will seek to tighten UN sanctions on North Korea even further, as well as argue that Iran is violating the 2015 nuclear agreement. At the same time, the United States will likely decline to endorse two new UN compacts on the humane treatment of migrants and refugees, the focus of the 2018 opening session. Such a pick-and-choose attitude toward multilateralism will risk isolating the United States at the precise moment it seeks solidarity. Complicating matters, the Trump administration will also likely find itself isolated on Israeli-Palestinian issues, which the General Assembly could take up in the wake of the United States’ recognition of Jerusalem as Israel’s capital. In autumn 2018, Indonesia will host the fifth edition of the Our Ocean conference. Established in 2014 under the leadership of U.S. Secretary of State John Kerry, the annual gathering convenes UN member states, as well as international organizations, corporations, foundations, nongovernmental organizations, and research institutes, to improve the dire state of the world’s oceans. This massive agenda includes expanding marine protected areas, combating and adapting to climate change, promoting sustainable fisheries, reducing marine pollution, improving maritime security, and promoting the “blue economy.” Indonesia, an archipelago of more than seventeen thousand islands and the world’s second-largest contributor to oceans plastic pollution (after China), is an ideal location to hold this gathering. To date, the Trump administration has maintained a low profile on global ocean conservation issues, and there is little expectation this will change. 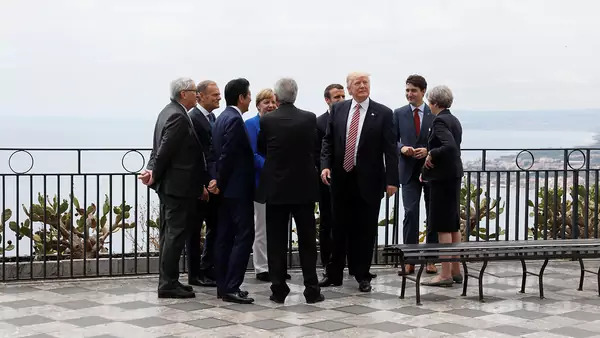 Long treated as an afterthought within the Group of Twenty (G20), Argentina gets to strut its stuff and prove its bona fides at the group’s first summit in South America. Domestically, the timing could not be better. Under the leadership of its still-popular president, Mauricio Macri, the country is finally shrugging off the populist politics and protectionist policies of Peronism and emerging as a leading champion of both democratic governance and globalization. Like previous hosts, Argentina has expanded the G20 agenda beyond purely macroeconomic and financial issues to address a broader range of global challenges. As priorities for leaders’ discussions, Argentina has chosen three topics: the future of work, including the implications of innovation and automation for education, employment, and equality; global infrastructure needs, both physical and digital; and the expansion of food security, including through sustainable agriculture. Of the many U.S. foreign policy shifts under President Trump, none has been as dramatic and damaging as his June 1 decision to withdraw the United States from the 2015 Paris climate agreement. The rest of the world has shown a dogged determination to proceed with it, with Canada, China, France, and Germany in the vanguard. They have been joined by a heterogeneous global alliance of cities, provinces, U.S. states, and corporations, which have collectively announced, “We Are Still In.” The United States was a no-show at last month’s Bonn Conference of the Parties (COP) to the UN Framework Convention on Climate Change (UNFCCC), leaving former New York Mayor Michael Bloomberg to raise private money for the U.S. pavilion. Without the White House having a change of heart, look for the same thing next year, at COP 24, where conferees are slated to focus on finalizing guidelines to implement the Paris accord. All is not lost in the United States, however: on September 12–14, California Governor Jerry Brown will convene the Global Climate Action Summit in San Francisco, a symbol of how U.S. climate policy has shifted to states, cities, civil society, and the private sector.